History-The F9F Panther was a sturdy workhorse for the US Navy and Marines during the 1950s. It made a good name for itself during the Korean War as both a fighter/bomber and as a reece platform. Known for taking a tremendous level of abuse and still going strong, the Panther continued to build on the solid reputation that Grumman had established since the 1930s. This kit is a bit on the simple side. Opening the small but sturdy box you have a fairly small number of parts all molded in dark blue (save for the crystal clear canopy) with very fine raised panel lines. There is no ordinance or pylons and the canopy is a one-piece affair. 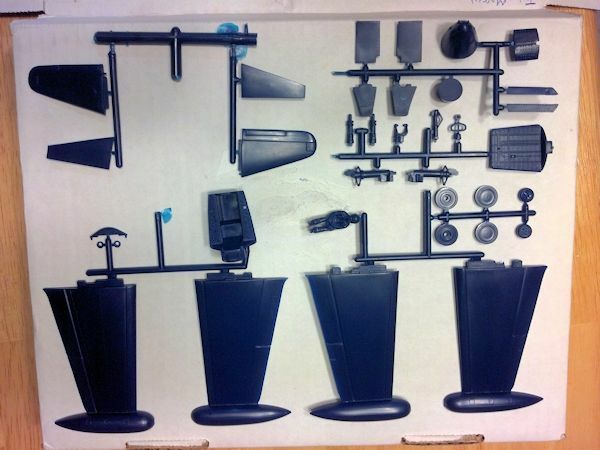 The parts are molded crisply and have very little flash. The fuselage halves are in their own bag while the wings and two sprues of other parts are in a 2nd bag. Of note is that the c anopy is also separate in its own bag as well. The boxtop mentioned 'retooled parts' but I do not have an original to compare with. What I have read on a pair of other forums is that it appears that the main wheels have been modified a bit. Gear bay detail is so-so but the depth looks good. The airbrakes are pretty sad affairs…I’d replace them or make some from sheet styrene. 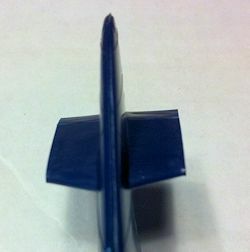 The horizontal stabs are oddly molded as the root half is molded ot the tail while the outer half is a separate piece. Odd but with some putty it should clean up/fit okay. Instructions are on a single sheet that folds out into three pages with the back page being the decal placement page. 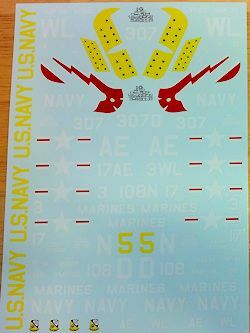 Decals are in their own plastic bag and consist of a total of six (6) different options including two Blue Angels aircraft. Sadly, the stars and bars are slightly out of register. They look a tad thick but I think they are useable. You also get a nice fold-out catalog of all of the Round 2 products for 2013. It’s a -2 and although antiquated I believe once built up (and with a few additions) this kit could look pretty decent. I know that the Trumpeter -2 and -2P have some questions about them and they cost about double one of these kits. The Monogram -5 could be used as a parts kit should you want to dress this one up a bit. I think that True Details makes a wheel set for the Panther as well. I scored my kit for $10 with the 40% coupon at Hobby Lobby and I think it’s worth that. 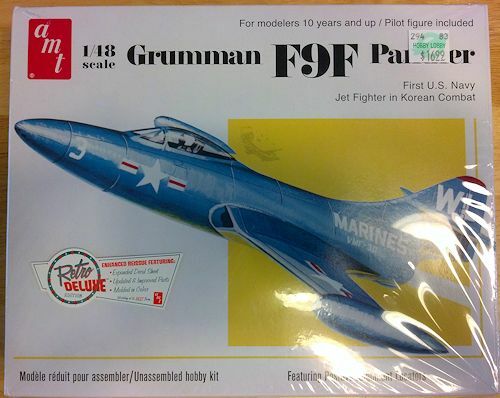 Editor's Note: I find it interesting that few actual hobby shops are carrying this kit. The LHS did not as they thought the kit was way overpriced and even HL had it on rather substantial discount if it was tagged at $16.99.